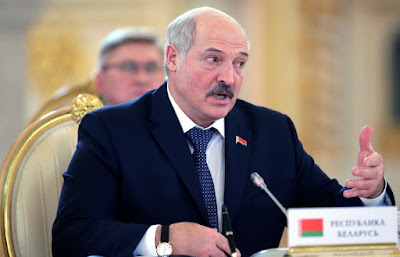 MINSK, Belarus -- Belarusian President Alexander Lukashenko has ordered state security KGB and law enforcement personnel to "deal with" gunmen appearing in Belarus after having fought in the Ukrainian conflict. "Some of these so-called brave men, militants who fought in Donbass, are already posing with their guns in Minsk," Lukashenko said, referring to the armed conflict between forces loyal to Ukraine's government in Kiev and those seeking independence for territories in the country's east. The attitude in Belarus towards "such warriors who fought in Ukraine with one party or another was well-known", the president said. "Deal with them immediately, together with police and the KGB," he told a meeting approving steps to protect the state border. "There should be no attention-seekers or gunmen in the country." Belarus State Security Committee records some 60 citizens of Belarus fighting in Ukraine. Interior Minister Igor Shunevich said in December that the ministry sent to the Investigative Committee evidence identifying 12 individuals who allegedly took part in Donbass region fighting.